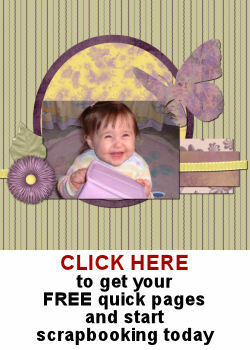 The picture tubes in Paintshop Pro are very powerful and versatile tools of this graphic program. No other program has these capabilities, and creating alphas or shapes is so easy to do that you will likely get addicted to the fun. Picture tubes come in many types but the ones we will use in this post are the string (or rope) ones. Some of them are directional as they have an obvious pattern that should follow the direction of the cursor, while some others are used incrementally as their pattern is basically just a matter of placing the individual images in order. You can purchase various strings and rope tubes in the store HERE. Since these picture tubes will follow the cursor move, you can simply hand draw, doodle or write with them. The tool you use will determine how easy or awkward it is to draw. Usually, a graphic tablet will probably feel more like drawing on paper, but if you are very comfortable with a regular mouse, that can be fine too. If you want a very "hand made" look, you can create your alpha or text just with cursor. It will be less precise, and less regular, but that is often the look we are after. In Paintshop Pro, there is a simple method to create straight lines, whether it is with a Brush tool, or a Picture tube. It is a matter of holding the Shift key while clicking on one end of the line and the other end. 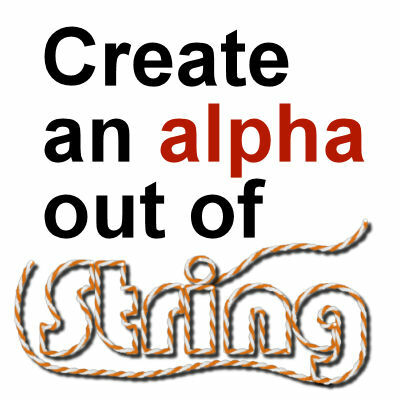 This tip can allow you to create your alpha if you are using mostly straight lines. However, unless you are creating a complete alpha exclusively with straight line (which might be ok too), you might need to combine straight lines, along with hand drawing. Although this is still a type of hand drawing, it should be more regular than free hand as you would have something to guide you. This month, in The Lab, there is a link to download a fun font that you can use to create a base to then, draw on a separate layer. It might be a better alternative to free hand drawing if you don't have great skills at doodling (like me), and since you are following an existing regular pattern, your result will look better than free hand drawing, yet, still have the slight unevenness of hand made. The last way to create alphas or designs is using a vector path. This will yield the most regular and even result. If that is the result you are after, this is the method for you. It does involve more steps, and more tools. First, you need to choose your design. It could be a text or a preset shape. It is essential to have it in a vector format. The colors for the fill or stroke will not matter as it will only be used as a path. 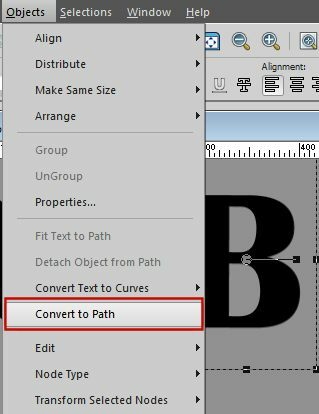 In the case of a preset shape (like the heart), that vector is already a path, however, if you are using text (like the B) you need to specifically convert it to a path. 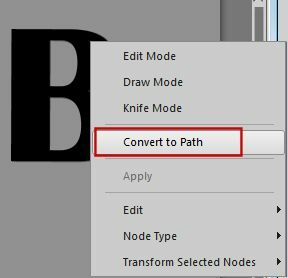 There are two methods for converting it to a path: with any vector tool active, you can go to Object > Convert to path or you can right-click on the text and on a menu that appears, select Convert to path. Then, you need to choose the picture tube you want to use, and adjust the settings, mostly the size. Since your font might be huge or small, the size of the string tube will matter. Choose the tube you want to use and test it on a raster layer on the same project (if you want to use a different image to test, make sure the zoom is exactly at the same level or you won't get an accurate display). Finally, activate the vector object, and run the VectorTube script (that you can download HERE for free). If you want to remove the base shape, you will get a great outline for your shape or your letter. If you want to create an alpha that is thin and can simulate hand drawing, you have to pick a very thin font. The VectorTube script will follow the path and whether you want it or not, any font has a fill and an outline in its design, but if you are using a very thin font, the opposite sides of the outline will be close together and depending on the size of the tube, it might be more or less visible, although it is impossible to hide unless you edit the vector path yourself to remove one line. But that is quite tedious! Are you ready to create your own alpha with a string or a rope picture tube? Go for it. It is so much fun. If you have created an alpha and used it in a project, post a link in the comments below. Do you want to learn more about picture tubes? Check out this blog post to see What you can do with Picture tubes. If you have followed the Make It Monday blog hop, your next stop is Beth's blog that you can view here. She is sharing an imperfect bible journaling tutorial. I’ve been a member for a while and do a lot of reading, but I didn’t know you know Rope Tubes! The funny thing is that just 2 days ago I was telling a friend that I wanted to make a card for a friend of the 2 of us with a nautical theme and that rope would be great for a frame with a navy and white chevron pattern for this friend. So then I decide to come on over and catch up on what I have been missing and find out you have a rope tube! So excited! *have Robe Tubes…sorry should have proofed that! I hope you will find the exact type of rope you are looking for. Otherwise, let me know and i might be able to make it. Such good ideas. Unfortunately my PSP is taking a vacation from me while I have my computer worked on (again) but I’ll look forward to trying some of those techniques when it returns. Love these useful blogs. Thank you.